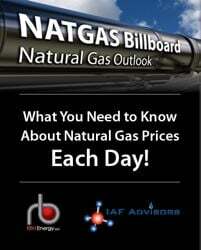 On Thursday, November 20, the ratio of ethane to natural gas hit its lowest point since 2005 – ethane only 64% of natural gas on a BTU basis. According to OPIS, the price of ethane in Mont Belvieu was 19.25 cents/gallon while natural gas at Henry Hub was $4.49/MMbtu. At this level it makes economic sense to reject as much ethane as possible. All the rest of the ethane that gets produced needs to find a use, a purpose, a home. Demand for ethane as a feedstock for the petrochemical industry will rise considerably as new ethane cracking capacity comes online, mostly in the 2017-19 period. Even so, ethane rejection is likely to remain commonplace for the foreseeable future. But what about ethane exports, not just to Canada but to Western Europe, Asia and other overseas markets? Today we update developments on the ethane export front. 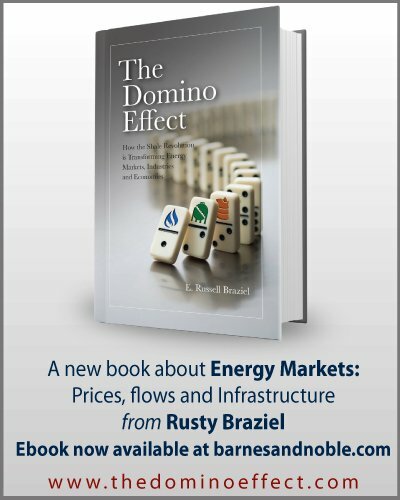 We’ve been talking for some time about the sharp increases in the production of ethane and other natural gas liquids (NGLs), which are tied mostly to more drilling in NGL-rich natural gas plays like the Eagle Ford, Permian, “wet” Marcellus in southwestern Pennsylvania and northern West Virginia and the Utica in eastern Ohio. We continue to hold the view that there will be a lot more ethane that could be produced than will be produced. As we explained in Episode 1 of this series, “potential” ethane production is estimated from the proportion of ethane contained in the “raw” NGL mix that gas-processing plants could produce if all ethane were to be recovered (ranging from 40 – 65 % of the total NGL barrel). We estimate that potential ethane production now at about 1.5 MMb/d up from 1 MMb/d in late 2011, and headed for 2 MMb/d in 2016 and 2.6 MMb/d in 2019. 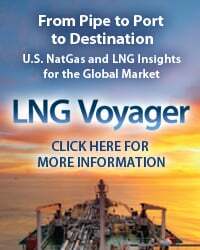 We say “potential” ethane production because if there isn’t sufficient demand for ethane (almost all currently used as a feedstock for petchems) then its price falls below the value of natural gas and it makes more sense economically to “reject” the ethane – meaning to leave it in the gas stream and sell it as natural gas. 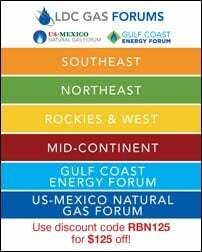 At the moment, current and projected potential ethane production exceeds by a wide margin the needs of the petchem industry, resulting in sagging ethane prices (falling yesterday below 20 cents/gal—or, as noted above on a per-BTU basis, only 64% of the value of Henry Hub natural gas, the lowest level for that ratio in almost a decade). [(19.25 / 66,500 * 10000) / 4.49] = .64 ; Backstage Pass subscribers see Ethane-to-Gas ratio Spotcheck graph. Ethane that cheap prompts three reactions: 1) it encourages ethane rejection into gas (about 270 Mb/d is being rejected today), 2) it results in high ethylene margins at petchem plants – providing impetus to proceed with planned expansions and new build projects to consume more (cheap) ethane, and 3) it prompts petchem plants in Canada and overseas to consider long-term ethane imports from the U.S. The first two of these reactions are happening already and as we explained last time, export terminal infrastructure is rapidly being planned to facilitate the expansion of exports. 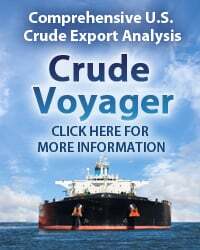 Exporting ethane is either easy or difficult, depending on the mode of transport. A quick review of ethane chemistry is in order. (No need for heart palpitations or flashbacks to Chem 101; this will be painless.) At standard atmospheric pressure, ethane boils off at -127 degrees Fahrenheit, which means it will remain in gaseous form unless it’s held under pressure or kept very cold. 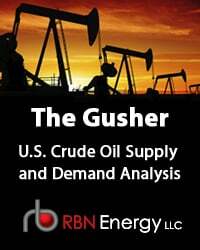 For that reason virtually all US ethane moves by (highly pressurized) pipelines and is stored in underground salt caverns, where large quantities can be held under pressure without the need to keep the product at near-cryogenic temperatures. 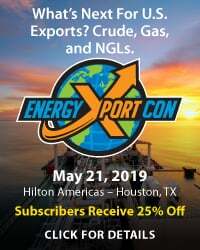 To access the remainder of You Ain’t Seen Nethane Yet—Ethane Exports Will Rise, But Will They Soar? 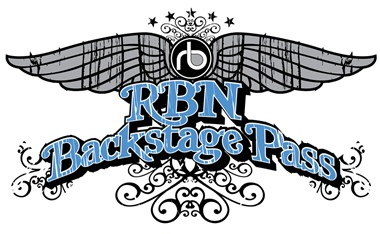 you must be logged as a RBN Backstage Pass™ subscriber.